St Nicholas’ Church is one of the most beautiful and famous churches in Estonia and is mostly known by the name of Niguliste. Even though it is no longer a sacred church, its presence in the city cannot be unfelt. Nowadays this building houses a grand collection of church art – altars, medieval gravestones, church silver and Tallinn’s most famous artwork − a fragment of Bernt Notke’s painting The Dance of Death. 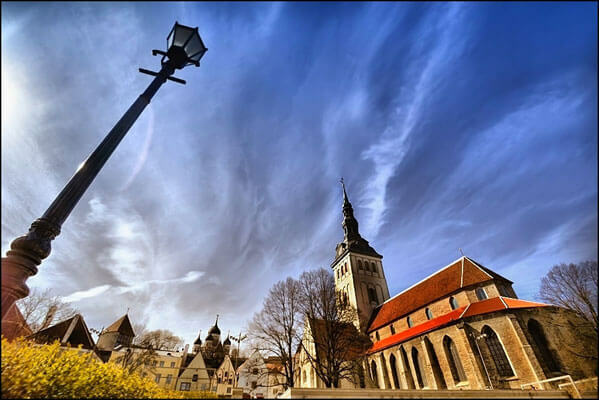 This magnificent structure is located in Tallinn Old Town and is only a minute walk away from the Town Hall Square. It was once a medieval church which was dedicated to the patron saint of seafarers and merchants − Saint Nicholas. St Nicholas’ Church is believed to have been built in the middle of the 13th century by the Westphalian merchants. Niguliste was not used only as a shrine or a secure fortress, but also as a place to store highly-valued goods. Later, in the 14th century, it has lost its fortress functions and became just another medieval church. There are only a few original parts of it which were actually able to make it safely through the test of time. In the early 15th century the church got its current appearance and was redesigned as a full basilica. The tower had now become even higher and got a late-Gothic spire. In late 17th century, the tower was strengthened and the spire was now replaced with a Baroque one which got higher and higher through several centuries. Today the tower is 105 metres high. During World War II enormous destructions were caused to the church and a lot of valuable art pieces were lost for good. However, some of them were successfully evacuated. During the bombing the church was hit and almost everything that was left in the building was destroyed by fire. After the war St Nicholas’ Church remained closed for years. The reconstruction started in 1953 and finally, in 1984, Niguliste was reopened for the public, and today it’s used as a concert hall and an art museum − Eesti Kunstimuuseum.